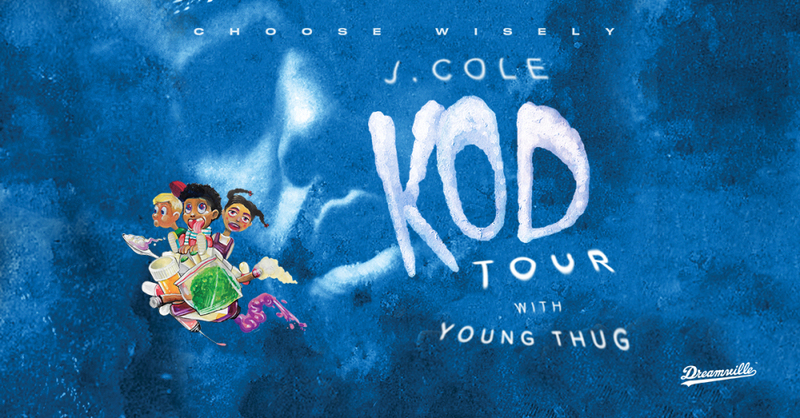 J. Cole has announced the dates of his North American Tour in support of his chart-topping, fifth studio album [amazon_textlink asin=’B07CH8SVCM’ text=’KOD’ template=’ProductLink’ store=’faroutmidwest-20′ marketplace=’US’ link_id=’60cf9e12-676f-11e8-aa59-053ba8c39f09′]. Joining him on tour will be special guest and American rapper, Young Thug, who will perform in 29 shows with the American hip-hop star. Produced by Live Nation, the 34-date tour will kick off on August 9th in Miami, Florida. From there, J. Cole will trek through the US, hitting major cities across the nation including: Atlanta, Las Vegas, Chicago, and New York. J. Cole will then make one last show in Boston, Massachusetts on October 10th wrapping up his North American tour.